Dr. Melkon Hacobian is a cardiologist who practices in Santa Monica. He is board certified in cardiovascular disease, echocardiography, nuclear cardiology and internal medicine. His clinical interests include coronary artery disease, valvular heart disease, atrial fibrillation, arrhythmias, congestive heart failure, cardiomyopathies, cardio-oncology, vascular disease and cardiac imaging. He is a registered physician for interpreting vascular imaging studies, and is a fellow of the American College of Cardiology. Dr. Hacobian received his medical degree from Tabriz University of Medical Sciences. He completed an internal medicine residency at the University of Massachusetts Medical School, and fellowships in venous thromboembolism at Brigham and Women’s Hospital in Boston and cardiovascular disease at Maine Medical Center. Prior to joining UCLA in 2015, he practiced at Concord Hospital Cardiac Associates in New Hampshire, where he also served as the director of the cardiac rehabilitation program. 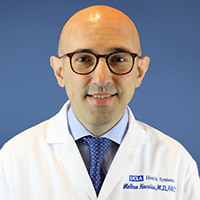 In addition to his clinical work, Dr. Hacobian has published in peer reviewed journals and contributed to medical textbook chapters in the fields of venous thromboembolism, valvular heart disease imaging, sudden cardiac death and pulmonary hypertension. He is also involved in teaching fellows and residents from the David Geffen School of Medicine at UCLA during their clinical rotation. Seder DB, Patel N, McPherson J, McMullan P, Kern KB, Unger B, Nanda S, Hacobian M, Kelley MB, Nielsen N, Dziodzio J, Mooney M. Geriatric Experience Following Cardiac Arrest at Six Interventional Cardiology Centers in the United States 2006-2011: Interplay of Age, Do-Not Resuscitate Order, and Outcomes. Crit Care Med 2014 Feb; 42(2):289-95. Hacobian M, Goldhaber SZ. Pharmacogenomics and Warfarin Anticoagulation, New Therapeutic Agents in Thrombosis and Thrombolysis, Third Edition, New York : Informa Healthcare USA, Inc. 2009: 37-48.